The Virgin of Humility, or the Madonna of the Lily as this painting is sometimes called (the Virgin holds the flower that more often is associated with scenes of the Annunciation), entered the collections of the Rijksmuseum in 1923, having previously been in the Quandt collection in Dresden (until 1869) and in the Augusteum in Oldenburg. It has long been recognized as fragmentary, as the arched top of the panel crops the Virgin's halo in an unconventional and inappropriate manner, although when it might have been cut to its present shape and size is unknown. In 1957, Carmen Gomez-Moreno identified a small painting depicting an angel, purchased in 1928 by the Wadsworth Atheneum in Hartford, as having been excised from the upper-left corner of the Amsterdam panel. This painting is gabled rather than arched, and shows a figure of the Man of Sorrows at the top that was probably not included in Fra Angelico's original composition, although it is possible that it did have a third angel at the top center. 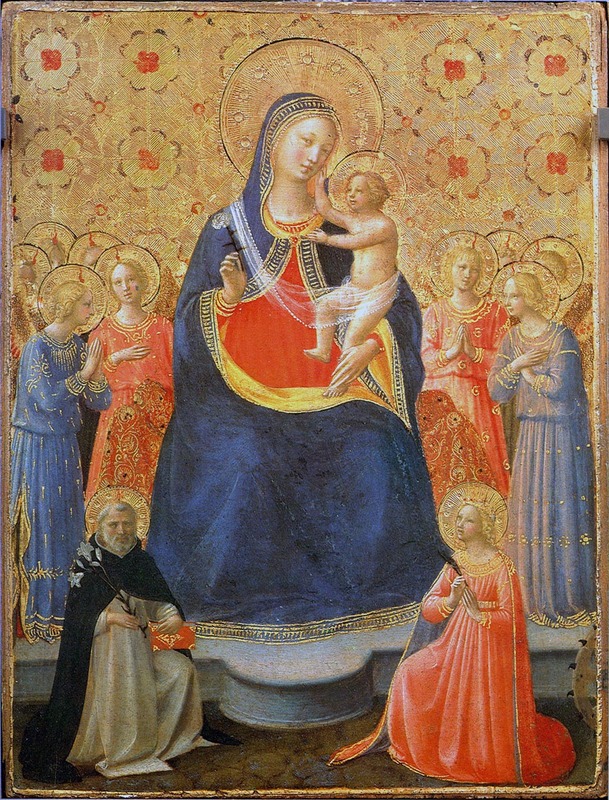 Discussions of the attribution of the Amsterdam/Hartford Virgin of Humility have tended to undervalue the quality of the panels and to assign their execution to Fra Angelico's workshop. (*3) However, neither panel can be properly considered without a full appreciation of its condition. The one in Amsterdam, in particular, has been damaged and liberally repainted, especially around its perimeter, and a large vertical loss in the shape of a candle burn at the bottom center has been restored. Most of the folds of the Virgin's blue robe have been reinforced, as have the outlines of her hands, and the two halos are nearly all modern. Similarly, all but a small arc of the outermost ring of the halo of the Hartford Angel is modern regilding, and the upper-left corner of the panel is rebuilt where it was originally cropped outside the arch of the composition. The feathers of the angel's wing at the lower right, beneath the upraised arm, are a fiction created by modern red glazes applied over the original engraved gold of the cloth of honor. Red glazes elsewhere on this panel are partly original and partly later restorations. Irrespective of these additions and reinforcements, both panels are tours de force of technical accomplishment, particularly in the refined engraving of their gold grounds to simulate the weave and texture of embroidered velvets. The looping folds of the cloth of honor behind the Virgin (which would have been supported by the angel) and the perspectival recession of the cushion upon which she sits are rendered with an astonishing precision of engraved hatching and translucent glazing: the cushion is decorated with a pattern of circles, each divided into eight segments, in the center of which are smaller circles engraved in opposing directions; every circle and segment is perfectly foreshortened to suggest not only the plane it occupies along the profile of the cushion but also the gentle deformation in that plane caused by the weight of the seated Virgin. The spreading folds of the Virgin's robe in the foreground, which are unaltered by restoration except at the extreme left and the extreme right, are typical of Fra Angelico's work in the 1430s and well beyond the capacity of any member of his studio. 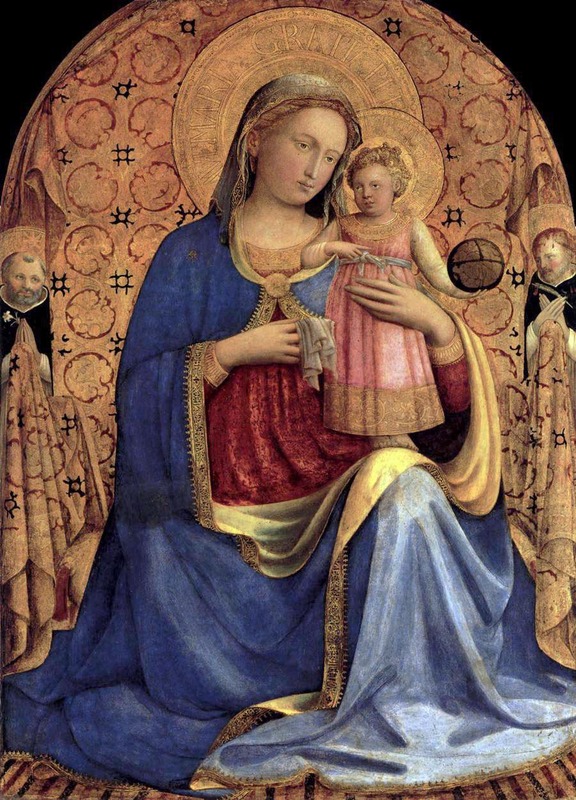 The figure types of the Virgin and Child similarly point to a date in the 1430s, probably near the end of that decade, after the completion of the Linaiuoli tabernacle and close to the execution of the Perugia and San Marco altarpieces. Following his earliest experiments with the theme of the Virgin of Humility, as represented by the paintings in Saint Petersburg (fig. 11) and Pisa (fig. 12) probably painted in the 1410s, and his first response to its treatment by Masaccio in works in Barcelona (cat. 18), Parma (cat. 21 A), and in a Swiss private collection (fig. 61), produced a decade later. Angelico returned to the subject in the 1430s in a series of compositions that synthesize his encounters with the art of Gentile da Fabriano and of Masaccio and his own maturing conception of the spatial and expressive potential inherent in an image that had otherwise been exploited by Florentine artists largely for its decorative possibilities.Two key examples of this mature approach to formulating the scene are preserved in the National Gallery of Art, Washington, D.C. (fig. 90), and in the Gernaldegalerie, Berlin (fig. 89), although both are severely damaged and liberally retouched. 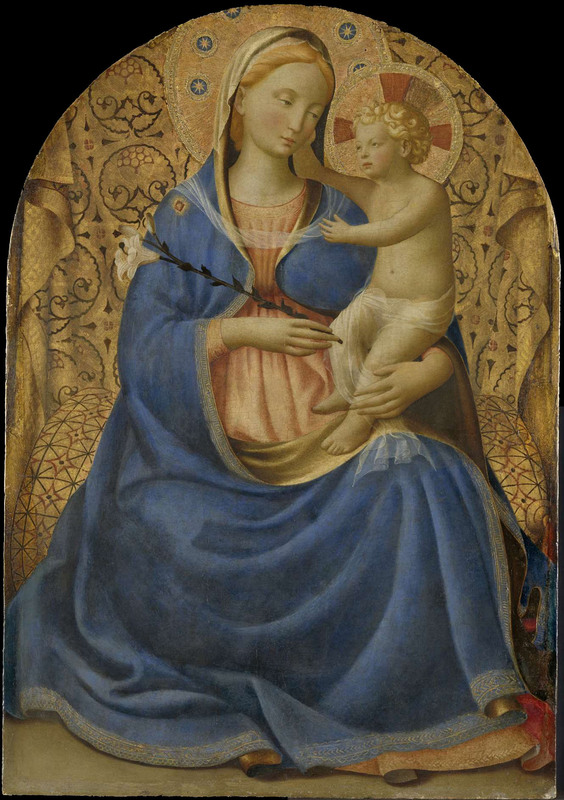 The Berlin panel is essentially a reprise of the main elements of Angelico's paintings of the Madonna now in the Thyssen Collection and in a Swiss private collection; from these works he adapted the poses and attitudes of theVirgin and Child and the looping folds of the patterned cloth of honor behind them. The extensive foregrounds of those paintings, or of the Parma Madonna, have been eliminated in the Berlin panel in favor of the brief indication of a steeply foreshortened carpet, its radiating orthogonals functioning almost like rays of glory engraved in a gold ground. The angels at either side in the earlier compositions have been converted into figures of Saints Dominic and Peter Martyr in adoration, and their function, supporting the cloth of honor, has been usurped by the (now missing) frame, to which the fabric is notionally pinned around the arch at the top. Inexplicably, the forward-projecting swags formerly held in the angels' lowered hands are retained in the Berlin panel but rendered as though draped over the arms of a throne that is not otherwise in evidence. A precise dating of the Berlin painting is not easy in its present state: although Saints Dominic and Peter Martyr are not badly preserved, theVirgin and Child, as they now appear, are essentially creations of the restorer, Helmut Ruhlmann. Nonetheless, Pope-Hennessy was correct in observing that the composition of the Berlin painting likely predates that of the Linaiuoli tabernacle (cat. 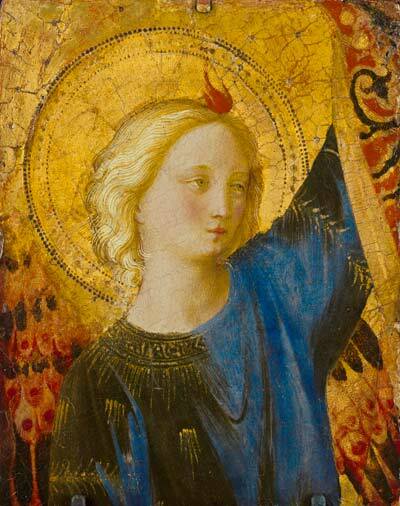 29), and that the figure types of the saints recall those in the predella to the Cortona Annunciation altarpiece. (*4) A date of about 1430-31 for the painting is probable but not certain. The Washington Madonna of Humility (fig. 90), on the other hand, must be a work roughly contem-porary with the Linaiuoli tabernacle, probably dating to the middle years of the 1430s. 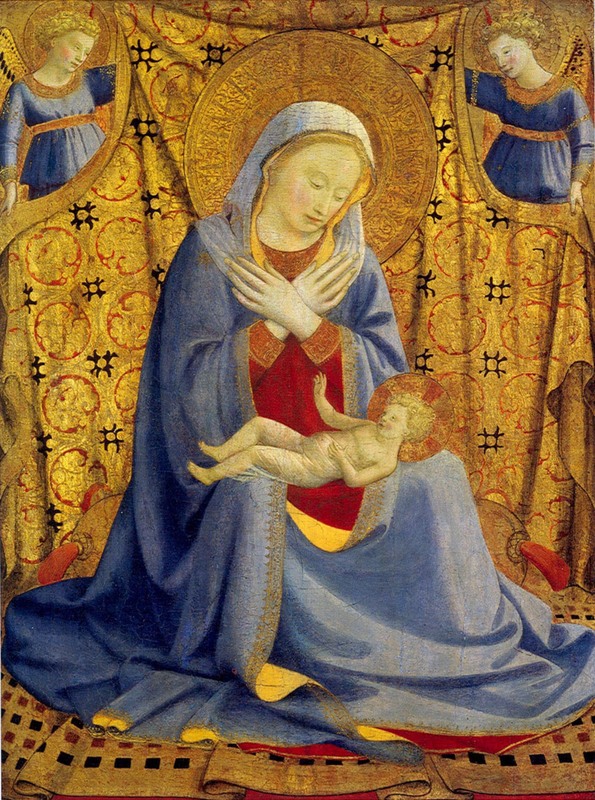 Other than reutilizing the carpet in the abbreviated foreground — the folds of which, rather than serving as radiating stripes, are used to establish a recession in space — and reintroducing two angels at the upper corners sup-porting the cloth of honor,(*5) this painting makes no reference to any of Angelico's earlier versions of the theme. His model here was Gentile da Fabriano's Pisa Madonna, in which the Christ Child lies across his mother's lap while theVirgin gazes reverently down at him with her arms crossed over her breast. The Virgin's rapt, devotional concentration and the completely enveloping curtain behind her make this an image of novel intimacy not attempted again by the artist, although her emotional engagement with her son rather than with the viewer would be explored later in the Amsterdam Madonna, and toward the end of Angelico's career in a final Madonna of Humility (fig. 173) now in Turin. The composition of the Amsterdam Virgin of Humility incorporates elements from each of these earlier efforts, as well as from the so-called Pontassieve Madonna in the Uffizi (see cat. 25) and from a small Virgin and Child with Angels, and Saints Dominic and Catherine of Alexandria, in the Pinacoteca Vaticana (fig. 91), where the pose of the Christ Child is similar. The most important difference between the Amsterdam Madonna and the examples from which it derives is the absorption of the holy figures with each other rather than with the spectator. As an image of private, contemplative devotion, it does not offer direct access to salvation through communication with the source of grace; rather, it demands an emotional and empa-thetic response on the part of the worshiper to create a bond with divinity through his or her own experience of humanity. This sophisticated shift of focus is emblematic of the maturation of Fra Angelico as a painter, stylist, and thinker: his development in all three respects was remarkable and continuous throughout the entire course of his career. (*1). Gomez-Moreno 1957, pp. 183-93. See also Cadogan 1991, pp. 42-44. (*2). M. Scudieri and A.Tartuferi, in Scudieri and Rasario 2003, pp. 146-50. (*3). Gomez-Moreno 1957, pp. 183-93; Pope-Hennessy 1974, p. 220; Cadogan 199., pp. 42-44. (*4). Pope-Hennessy 1974, p. 221. (*5). M. Boskovits (in Boskovits and Brown 2003, pp. 9-11) has advanced the not-unpersuasive suggestion that a third angel at the upper center has been excised from the painting, which would then originally have been just under ninety centimeters tall (it presently measures 63 x 47 centimeters). Boskovits proposes a date for the Washington Madonna in the late 1420$, but between 1432 and 1435 seems more satisfactory to this writer, who must withdraw an earlier, tentative proposal to identify the panel as the center of a triptych completed by the wings exhibited here as catalogue 16 (see Kanter 2001a, p. 34).